By old.gimmers, February 1 in How Do I...? Do you mean you can't start Garmin Express even from its icon in the Start Menu? If it won't run, try to uninstall/reinstall Garmin Express. The newest version is 6.11.1.0.
thanks. tried that and still only managed to down load way points for parkingetc. got somebody to try a new on their lap top and they also got the same result. does it matter which browser you use ? What model of GPS is it? Which browser are you using? I'm guessing you simply need to switch to a Geocache page on your GPS. "Waypoints" is a different page, but if you received those, you (probably) also got the Geocaches. Remember that a Garmin GPS is easy to set up so that it's useless for Geocaching. Be sure it's instead set up for Geocaching. Looks like most modern browsers can call Garmin Express just fine. I tried Edge just now, the most finicky about "plugins", and even that one seems fine. I most often use "IE 11", but it's probably high time to begin a switch to something newer. Anyway, if you are using Lists (which is the only way "Send To Garmin" currently works), and if you get anything at all onto your Garmin GPS, it's more likely a setting on the GPS. You must follow steps properly to get it all working. There's a learning curve. But once it's set up, and once you have a process figured out, you're golden. 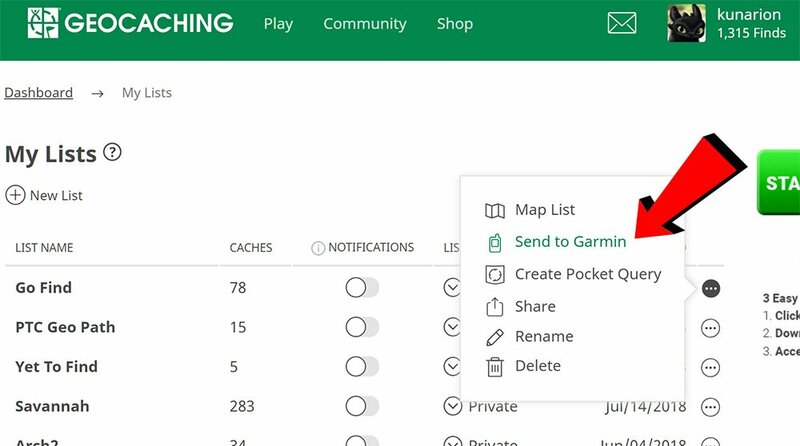 "Send To Garmin" is probably the easiest way to get a whole bunch of caches onto a GPS at once.